Funkwerks of Fort Collins, Colorado is well known for its line of fine Saisons. The recognition for their beers hit a high note in 2012 when they won the Small Brewing Company and Small Brewing Company Brewer of the Year at the 2012 Great American Beer Festival. While this beer review is not about an award winning beer per se, this beer's history has made a name for itself in reputation. 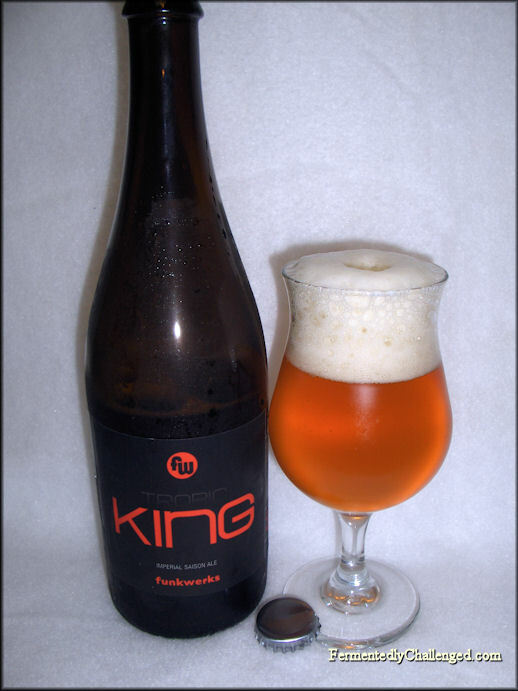 Today we review Funkwerks Tropic King Imperial Saison Ale. Tropic King is a bigger, bolder version of a saison weighing in at 8.0% ABV. Funkwerks sells this on draft and in 750ml bottles. Funkwerks used Rakau hops from New Zealand which was part of the inspiration for the name. Forget the fact that this beer went through a name change early on, what's more important is how it tastes. Since this is a bigger saison than most (an imperial), it should be able to stand up to cellaring for about a year and still be a quality beer. Funkwerks suggested pairing this beer with mango chutney pork chops, but you can pair it with almost any dish that would benefit from a big flavorful beer. Saisons like this beg to be served in a tulip glass to give you the full experience of the aroma, head display and flavor. Serve this beer around 50 degrees F for best experience. Now that you know the stats, let's get into this beer. 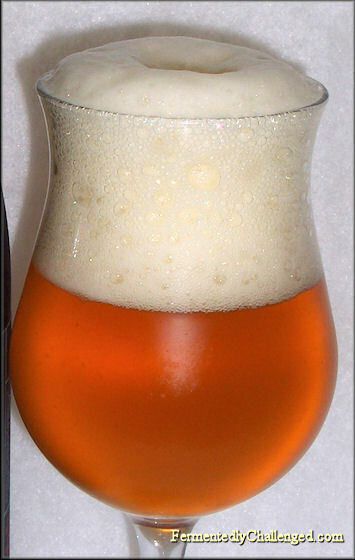 Appearance: Funkwerks Tropic King poured a medium golden color with a beautiful off-white billowing head. The beer itself started out cold and slightly hazy, but seemed to clear well after warming to serving temperature in the glass. The first pour out of the 750ml bottle had no sediment, had good clarity and had great head retention with a slick lacing. There seemed to be an abundance of carbonation in this beer. Aroma: There's a lot going on with this aroma. There was the presence of a sweet fruits, earthy spices and yes, a bit of funky yeast. I could pick up some peppery tones amid the tropical fruit, and by fruit I don't mean apples or oranges, it's tropical fruit. The Rakau hops impart this aroma and it's unlike most other hops. It was a great choice for this beer. The aroma was unique and inviting, and half the battle of winning people over is the aroma. Taste: Tropic King has a bold taste. Up front there was a hit of earthy spice, peppers, fruit, slightly sweet malts, a bold bitterness and a finish on the dry side. A lingering taste of peppery fruit stayed on my tongue for quite a while after the sip was done. There is a classic saison yeast funk in this beer that seals the deal. Being an imperial saison, everything about this beer is up a notch. The carbonation is on the higher side, but seems to work with this beer. This beer worked best as a slow sipping kind of drink. I took my time with this beer and am glad I did. Lots of flavor, a big aroma, a touch of warmth and an endless variety of flavor. This beer just begged to be paired with good food. Overall: Funkwerks seemed to put a lot into the recipe for this beer. Between the funk, the spice, the sweetness - this turned out to be a fantastic beer. For this 750ml bottle, I highly suggest sharing this beer as one glass of this will be plenty for most. This beer has a lot going on. Take the time to savor this beer. Suggested for people who have had saisons before. Those who have never had a saison before may be surprised at all this flavor. Give this beer time, pair it with great food and enjoy. I certainly enjoyed this Tropic King. - Danny Williams remembered in a collaboration beer. - Crabtree Bret Orange Blossom Saison.